Downtown restaurant updates undeserveing of their own thread can go here. That new place, Maruso, in the Skyway Theater building opened a couple weeks ago. They unfortunately don't have pho like I had really hoped... But I guess that doesn't really matter, cuz Lotus ftw! Mona Restaurant is one of the newest downtown, and IMHO some of the tastiest food you can find. If you can find it, it is street level in the Accenture Tower on 8th St, in a nicely renovated space. I just learned they validate parking for the ramp under the Accenture Tower now. Finally, a render for the old Shinder's building/ future home of Shea on Hennepin. That roof will certainly be interesting to see. *edit - turns out this article contains the same information as the star trib article. A wonderful addition to Hennepin Ave and the entertainment district. This is the kind of project that will put Minneapolis on the map. It's interesting how vibrant and creative our restaurant industry is downtown, yet our other retail is so lackluster with stodgy landlords controlling the big downtown malls who won't put a penny of investment into improving their buildings. Pisses me off! Depending on where you're standing, you can probably see the tops of the "Big 3" from that rooftop - especially from the corner at Henn. & 8th St.
Looks like if you're standing on the edge, (and people are pleading with you not to jump) You might have glimpses of IDS, The Radisson, US Bancorp, and probably some Target action which would be good in the evening. 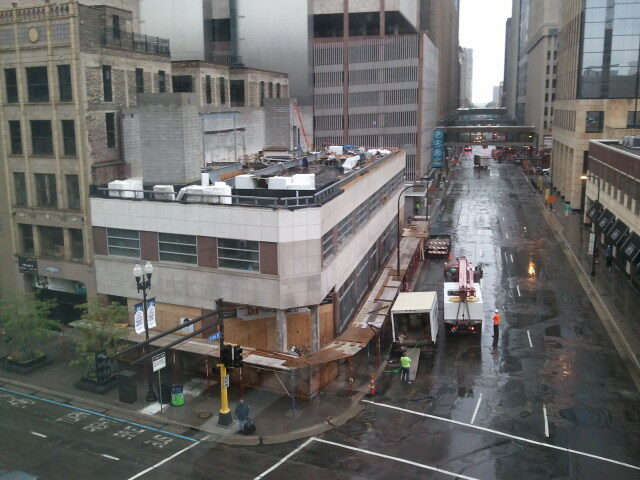 They'll be able to see the IDS tower without issue, Lasalle plaza across the street. 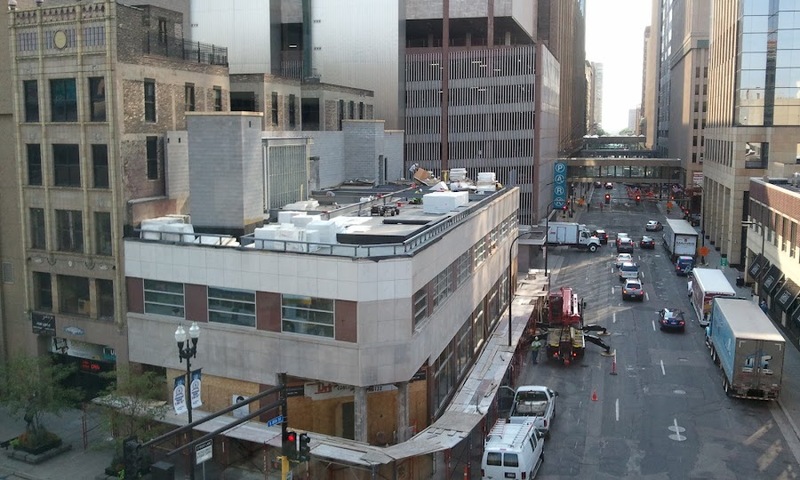 The skyway will block the state theater and the orpheum, but if you stand in the right spot, you might be able to see the other way down henn. I read a recent proposal that is looking to convert the upper floors of building across 8th street from the Pence building (the Pence is kitty corner, this building is directly across 8th from shinders) to residential use. Not sure the story on that though. spearson wrote: I read a recent proposal that is looking to convert the upper floors of building across 8th street from the Pence building (the Pence is kitty corner, this building is directly across 8th from shinders) to residential use. Not sure the story on that though. fotoapparatic wrote: Looks like if you're standing on the edge, (and people are pleading with you not to jump) You might have glimpses of IDS, The Radisson, US Bancorp, and probably some Target action which would be good in the evening. I'd "like" you or give you a "rep point" if I could, as I liked your slant on the first part! I think the $10/drink covers the retractable roof with spectacular views.....for eye candy potential they'd have to charge more like $12/drink! At the time, I figured that this place was opened with the assumption that Shout House would eventually get the pink slip from Block E. It was a pretty fair assumption actually, with Block E's owners planning to boot out other successful tenants (like the movie theater) to realize their casino dream. I guess Howl at the Moon was a bad bet. Retail is having a difficult time with the transition to online shopping. I would think that plays a large part of the difficulty in maintaining/reinvesting downtown. At the same time, dining out is consuming a larger portion of discretionary income than ever. It that really the retailers' fault? Smack shack at (I think) 605 Washington is moving along slowly, but it's moving along. They recently installed large green commercial/industrial style doors all around the side. From the looks of them they'll be opened when the weather is nice.